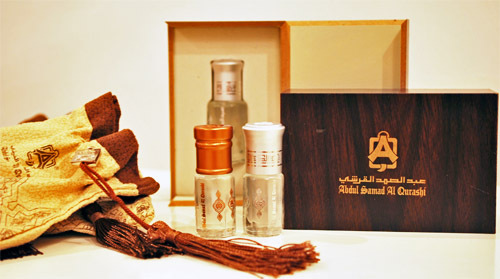 A Kuwaiti friend recommended the Bride Musk from Abdul Samad Al Qurashi (ASQ). She vowed that it was one, if not her most favourite scent. We went to an ASQ store (Arraya 2 Mall) near our office and she asked the guy who worked there to dab a drop of oil on my wrist. Oh my, I immediately became a fan. It really smelled good! So fresh, oh so clean. I honestly loved it! The beautiful scent lingered through the rest of that day. Hubby even noticed it when he picked me up from work. The bottle may seem cute but I guarantee that it will last long. The best way to use it is to apply immediately after a bath or shower a small amount of oil directly to your pulse points - inside the wrist, behind the ears, back of neck, base of throat and/or cleavage area. A note of warning though, the Bride Musk perfume spray is not as good and the scent does not stay on as the oil. My friend's advice is not to waste money on it. Just stick to the oil.